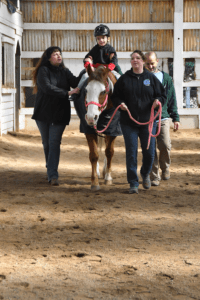 Adaptive Riding is recreational horseback riding lessons for individuals with special needs. Riders learn horsemanship and riding skills in an environment that is custom-tailored to their needs and learning styles. We work with the rider and their family to set measurable long-term goals for their progress. The goals for those in the adaptive riding program are riding-skill as well as therapeutically based. These benefits include improvements in physical strength, balance, coordination, mobility, self-confidence, self-control, peer interaction, and social skills. While we set long term goals, one of the benefits of choosing Scooter’s Place is that we take each lesson as it comes. Wherever the student is on that particular day is where we work. We know that, especially children on the spectrum, but even people working through physical challenges, have good days and bad days – a bad night’s sleep, changes in the home environment, additional therapies that are leaving them tired, or even a reaction to a gray day. It is important to us to keep the lesson fun and stimulating regardless of the type of day the rider is having. If that means moving backward a bit on the progress that had previously been made, there is nothing wrong with that. If that means that they don’t even get on the horse but do activities with a horse nearby or participate more in some grooming, that’s where we take the lesson. For children, we work very interactively with their parents to determine daily goals to help keep their session productive but don’t leave the child too tired to participate in the rest of their day. 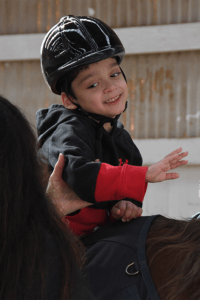 Adaptive riding lessons often incorporate games and exercises designed to meet each student’s needs. The goal is to keep the time fun and diverse and to disguise therapeutic movements as games and play time. Sword fights and balloon tosses are favorite activities, as are egg hunts, ornament decorating, and even leprechaun clean up. Why does horseback riding work? The combination of the rider’s posture and the horse’s walking rhythm and three-dimensional movement help to improve circulation and muscle tone for the rider. The disciplines used in working with a large animal and the progress through varied skills, create a feeling of accomplishment and pride in the rider. Horses are willing and non-judgmental, which helps to create a bond between horse and rider that is indescribable. During riding, the horse’s movement naturally mimics a person’s motion while walking. This repetitive motion cannot be duplicated by machines or in physical therapy. In this way, the horse aids in relaxing the rider’s muscles and increasing his or her balance and flexibility. In addition, every rider has between 2 and 5 people helping guide them through the lesson. These volunteers are supportive, upbeat, and 100% focused on the lesson at hand. This focus can help with the rider’s social skills, provide distraction from potential discomfort or fear, and can provides up to five sets of eyes on areas of improvement and of success. Our volunteers are completely committed to the success of each lesson and many form firm friendships with the riders and their families.